I feel the frustrations witnessing students endure the many hardships NCLB has created for them. School is nothing like it was when most of us reading this went. In our middle schools and high school the students must score higher than “Basic” on the state standardized test or they have to take double periods of English and/or Algebra. Most of them don’t get to take any electives until their Junior year with all the other required courses in their schedules (at least not electives that they “elect” since the extra period of English and Algebra count for their elective credits). Some students also take very little or no Science or Social Studies in middle school and elementary school. The majority of these students are English Language Learners, Special Education students, and/or at risk youth. Requiring these students to have an all academic day is robbing them of more than just a normal high school experience. It robs them of opportunities to explore new interests, find undiscovered talents, showcase those areas or fields they excel in, and develop leadership or other skills relevant to their future. It’s hard for me to not see this as discrimination against these groups of students. Not only to they not get a break from rigorous academic work all day, they are stuck in boring mandated scripted programs that only focus on scoring higher on the tests and cover little else. Actually this is true for all students that don’t take AP or honors classes. The mandated methods and materials now used to teach state standards have turned what used to be interesting, even exciting, classes where actually learning took place into dry, monotonous, task based curriculum with routine exercises that rarely tap into higher level critical thinking skills. They have workbooks instead projects or problem solving assignments, edited anthologies instead novels, and rote tasks instead of class discussions. This is not an environment that lends to developing critical thought, communication, or appreciation for reading and literature. And when there are interesting assignments that involve processing and analyzing information, there is so little time to teach how to do this (or have class discussions practicing it) that the lessons are often confusing and leave many not understanding what is being asked of them. With the fierce pacing guides and overpaid consultants looking over the shoulders of teachers, they must move on to the next assignment in the scripted program, knowing that few can synthesize and apply the concepts of the previous one. In my opinion it is the very skills these classes now lack that have more to do with preparing students for the work force or college, let alone successful and meaningful lives. Our students today are missing out on more than just cool classes with the creative and effective teaching methods of the past. They are missing out on instruction related how to think, form conclusions or opinions, and how to appropriately communicate these (including written expression). An example outside English or Language Arts classes is the Algebra issue. Not everyone is ready for algebra in the 8th grade for a variety of reasons. However, schools get more credit for having everyone in algebra classes, hence the push for algebra for all in the 8th grade, ready or not. There is still an enormous amount of students failing subjects despite many additional supports in place. 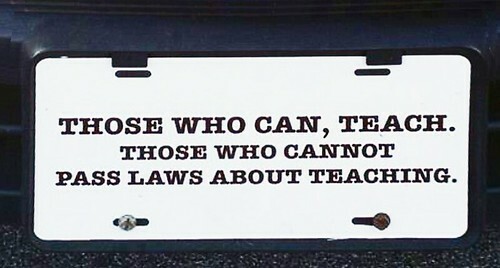 NCLB has let parents off the hook by holding teachers accountable. The alarming level of truancy, the work habits of unmotivated students, and behavior issues are the factors that affect the failure of students in our education system. The expectation of above average or college prep performance from every single student with this cookie cutter approach can be directly related. Teacher accountability is necessary but it needs through a system that uses logic and is not so devastating to students and teachers.